Hi Folks, Could everyone please post photos of tested minimal tobianos. Just having a discussion on another general horse forum & the general concensus is that tobianos must have a body patch :BH Have tried to explain, not necessarily so, some pictures would be good. Thanks in advance. Tested twice for tobiano, once with the marker test, once with the mutation test. I need to bookmark this site for a few "experts" that I know who swear my mare is that dreaded "TO" word (don't want to be smacked by RF - :laugh1 ) and yet horses like this are NOT (because of no body white :hammer ). Oh very interesting set of pictures. BTW that top one is visually also a splash. His hind socks are way too much higher than the front for only tobi and that snip, er...white nose, is screaming it. note how the others with no face white have more even socks. The hind white movement on the first one is very much a tobi thing though. It seems most minimal tobis I've seen have higher white behind (especially minis). I wonder if that horse has frame too. If that nose isn't Splash I'm a duck. I agree the snip is splash. I just don't think the splash is having much, if any impact on the leg white. 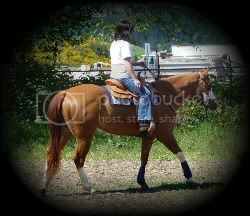 This thread is so so old, but is there anyway to get the pictures from it into our tobiano gallery? I find myself searching for these images often, and if they were in the gallery it would be easy to find. ^ I concur and second the motion! 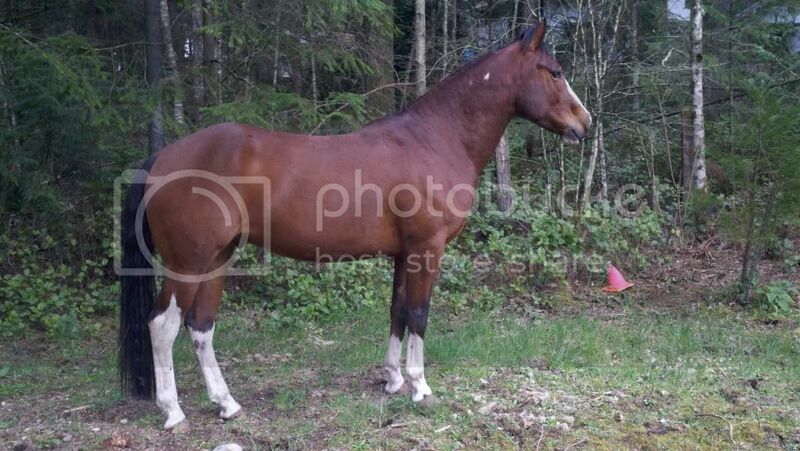 If someone knows the contact information for A Tru One Ina Million and the other big horse I can request permission to add them to the gallery. For the time being I will sticky this thread. I have 2 minimal tobianos in my herd, a mare Savannah (top 2 photos) and her sire Basil (bottom 2 photos). Both are nTO, so far their tobiano has proven to be linked to their red genes. Both also have ermine marks. Savannah has less white than her sire, 2 front socks and 2 large stockings that one goes into her tail. She also has a smudge of white at the lower point of her mane, hidden under the mane, and a small star. 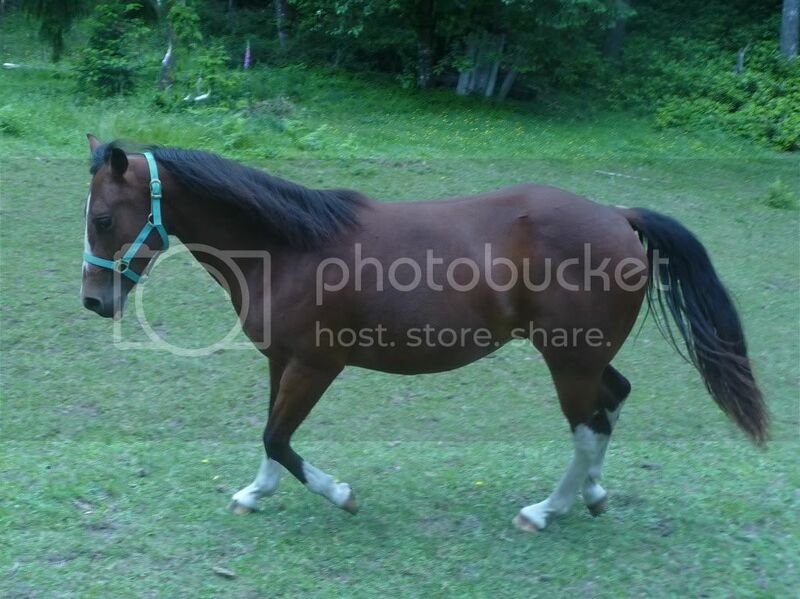 Her dam had no white whatsoever, no tobiano. Savannah produced a very white tobiano colt (pictured with her in one photo, see more on my website) to a stallion with no white, no tobiano. Her colt has no ermine marks showing, currently aged nearly 2 years old. 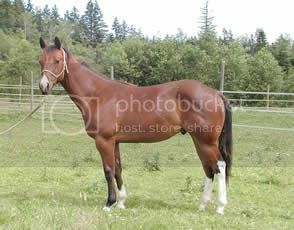 Basil has produced many foals with varying quantities of white, some to solid mares, others out of tobiano mares. He has 2 short socks on his hinds and 2 taller socks on his fronts. 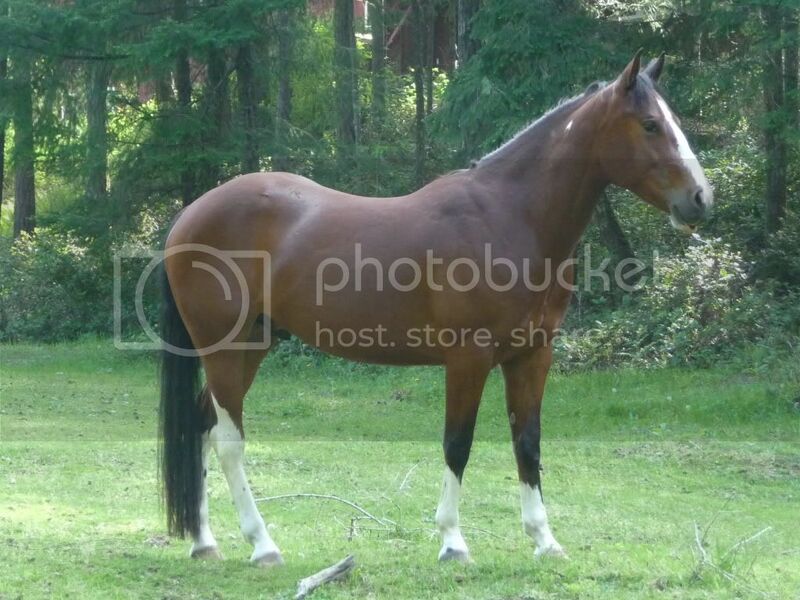 His only body white is the patch across his withers, there is an ermine mark(?) in the middle of the larger side. No facial white. Currently there are no other testable white patterns in British Shetland ponies than tobiano and roan. I have been asked to test some of my herd for Splash since they have a blue eye and some bottom heavy face markings. 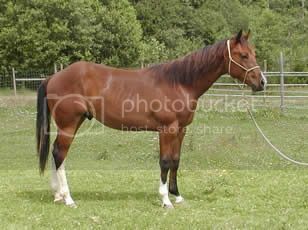 Homozygous stallion genetic markers...TT EE aa CcrCcr.